William Lacy Swing, IOM director-general, addresses a news conference next to Filippo Grandi, High Commissioner for Refugees, after the morning session of the Pledging Conference for Rohingya Refugee Crisis in Bangladesh at the UN in Geneva, Oct. 23, 2017. The heads of leading United Nations aid agencies have kicked off a special one-day pledging conference to raise $434 million to provide life-saving assistance for 1.2 million people, including all Rohingya refugees and host communities in Bangladesh. Before the pledging conference got underway, a spokesman for the U.N. refugee agency told media the number of Rohingya refugees who have fled violence in Myanmar over the past two months has now topped 600,000, making this the world’s fastest-growing refugee crisis. FILE - Newly arrived Rohingya Muslims, who crossed over from Myanmar into Bangladesh, rest in a field after spending a night in the open as they have been prevented from moving ahead towards refugee camps by Bangladesh border guard soldiers at Palong Khali, Bangladesh. Aid agencies agree the crisis is also drawing one of the most severely underfunded responses in the world. 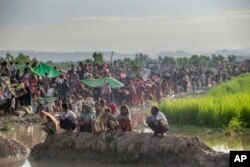 Reacting to the growing and intensifying needs of this burgeoning refugee population, Undersecretary-General for Humanitarian Affairs, Mark Lowcock says the focus of the event is to mobilize resources to save lives and protect people. 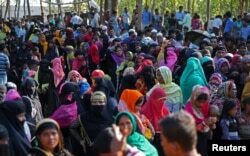 Rohingya refugees line up to receive humanitarian aid in Kutupalong refugee camp near Cox's Bazar, Bangladesh, Oct. 23, 2017. Since the crisis began, U.N. agencies have been providing the refugees with urgently needed food, shelter, water and sanitation, health care and other relief. They say humanitarian operations need to be scaled up, but they are cash-poor and are unable to do what must be done. Indeed, they warn critical aid will not be sustainable without an injection of substantial funds. For example, the World Food Program, which is providing rations to 580,000 people, has received only 30 percent of what it needs to continue this operation. While children comprise nearly 60 percent of the Rohingya refugee population, the U.N. Children’s Fund reports its appeal for support has received a shockingly low seven percent.